For many people keeping fish is the main reason for having a pond. There is something intangible yet amazing about seeing fish in a pond, it will give the pond a magnetic draw, and they will become a source of constant pleasure for many years. Keeping fish has to be one of the easiest pursuits imaginable . With Hozelock Cyprio's modern and highly effective filter systems, it's possible both to enjoy your pond and provide clean crystal clear water all year round so that the fish always remain visible. Identification: (Asiatic form) greenish when young changing to golden red as an adult, body shape variable, head scaleless, no barbels. Habitat: Densely weeded lowland rivers, lakes, and ponds. Breeding: Eggs laid on water plants in June and July, they take 7 -9 days to hatch, the young fish stay attached to the plants. Note: Goldfish are the most common pondfish. Goldfish are inexpensive and fast growing. They are available in a variety of patterns and body shapes. Goldfish need a pond that has a minimum depth of 18" but a pond closer to 2'6" is more acceptable. However the more unusual varieties are less hardy than the true goldfish. Identification: Heavy set fish, rounded body, deep tail, large head, single barbel at each corner of the mouth, small reddish eyes, tiny embedded body scales, deep green body changing to yellowish underneath. 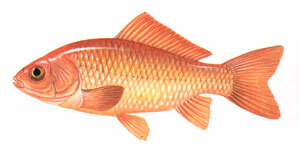 Habitat: A still water fish found in lakes and pools, the lower reaches of rivers and marshy deltas. It can live in water that is heavily silted and full of weed, and can be very tolerant of high temperatures and low oxygen levels. Breeding: They spawn in late spring and early summer and lays eggs in vegetation, the green eggs stick to the plant leaves they hatch in about 6-8 days. Note: Tench are a bottom dwelling fish that unless you have crystal clear water will rarely see. They feed on the bottom of the pond but will come briefly to the surface to take food. There are Golden varieties available. Identification: Scaleless head, body can be scaled or unscaled depending on the variety, as can colour , mouth toothless and has two barbels at each side. Breeding: Late spring in shallow sun warmed areas over dense vegetation. The eggs are attached to the plants. Note: Koi are the most rewarding of pond fish. They are available in a bewildering selection of varieties. Don't be put off by the Japanese names of the fish or by the high prices that they can fetch. If you see a fish you like in a pattern you like at a price you can afford - buy it. The most important thing is the health of the fish, a £2000 fish can die as easily as a £2 fish. That aside, Koi can grow to 3' if conditions allow, they are fast growers and can consume a lot of food. They are avid rooters in pots and as a result can make the water dirty if an effective filter is not installed. The depth of the pond should be 3' minimum. Hozelock Cyprio have long had a passion for fish keeping, our filter systems were originally developed for keeping our own fish healthy prior to sale. Times change, and now as the best manufacturor of effective filter systems we have used our knowledge of fish to design our Guaranteed Clearwater Filter Systems.